Lyrics by Howard Ashman and Glenn Slater, Music by Alan Menken, Book by Doug Wright, based on the fairy tale by Hans Christian Andersen. The Disney Renaissance found its legs with the 1989 hit animated film The Little Mermaid. This adaptation of the classic Hans Christian Andersen tale was an instant hit and finally translated to the Broadway stage in 2008. In it, the little mermaid Ariel, youngest teenage daughter of King Triton and his late wife, is more obsessed with dinglehoppers and other human stuff than with remembering to sing in crabby composer Sebastian�s concerts. When she saves and falls in love with human Prince Eric, a merfolk taboo is broken. If she wants a chance to become human and marry her prince, she�ll have to make a deal with Ursula the Sea Witch, forfeit her voice, and get the prince to kiss her before three sunsets have passed or she�ll be Ursula�s slave for all time. Howard Ashman and Alan Menken (Little Shop of Horrors) would become Disney superstars beginning with this musical featuring Part of Your World, Kiss the Girl, and Under the Sea. 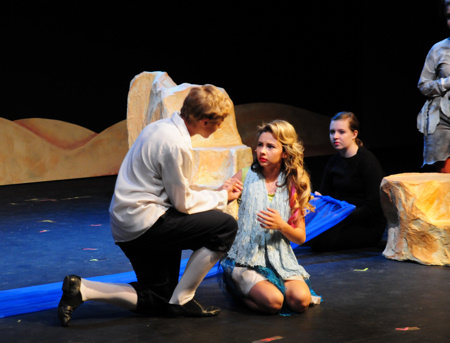 Aubrey Grace Watkins directs Desert Foothills Theater�s production in Scottsdale. The game cast of merfolk, sea creatures, seagulls, and coastal humans is almost entirely made up of eighth grade or younger students. 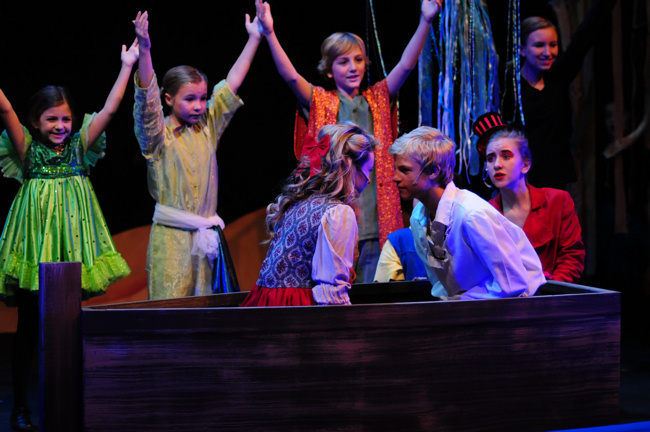 That includes eighth grader Meagan Multz as Ariel who interacts well with her friends eager to help her reach her dreams above the sea and marry Prince Eric (a good-natured Ryan Mackiewich) against King Triton�s (Chad Johnson) command. Those friends include Kiara Adams as a cute and loyal Flounder, Ashley Shirley as a stressed and melodramatic court composer Sebastian, and Josie Brzenk making for an amusing human stuff-expert Scuttle. But not everyone is Ariel�s friend. 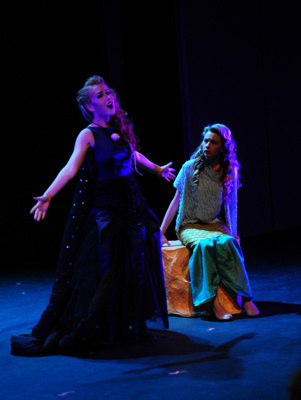 The sinister Flotsam (Chloe Otstot) and Jetsam (Hannah Raether) lead the little mermaid to the lair of the evil sea witch. Julia Horner is Ursula, devilishly using strong vocals both singing and speaking to great effect as she intimidates Ariel and mocks all the Poor Unfortunate Souls who have asked her for favors. 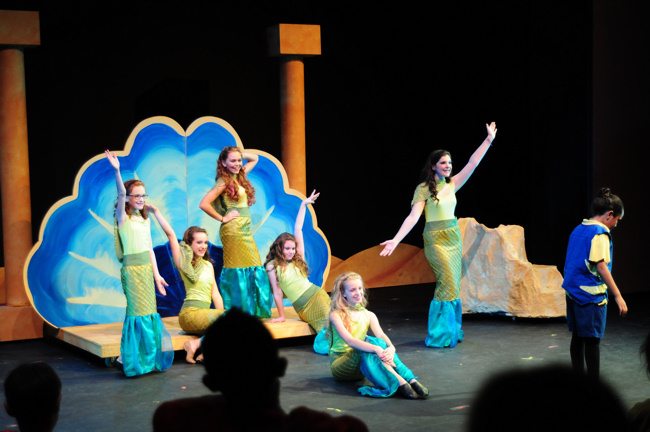 But Ariel will risk it all because She�s in Love, with mersisters Shannon Chumbley, Noelani Enlow, Kendra Ingram, Angela Nauroth, Tara Prager, and Brittany Whalen combining for an entertaining gossip number with a second chorus assist from Flounder. Sebastian also risks it all thanks to a highly determined Chef Louis (Kayla Dobbs). But all those risks would have been avoided if Ariel had been persuaded by Sebastian�s cast of infectiously happy and laidback sea creatures Under the Sea.